It's April and the weather is slowly warming. In fact, it never stayed very cold for an extended period of time this winter, so you dog owners know what that means. Here come the ticks, and this year there'll be an army of them. Tick season: that time of year when bloated little arthropod vampires get warm and hungry and feast on cattle, wildlife, humans, and DOGS. But ticks aren't just disgusting, they're also dangerous.When ticks bite wild animals such as deer or squirrels, they take in the bacteria these animals may harbor and can pass them along to their next host. Some bacteria can cause diseases in dogs (and in people) - dangerous, debilitating, and sometimes even fatal diseases such as Lyme disease, ehrlichiosis, babesiosis and Rocky Mountain spotted fever. 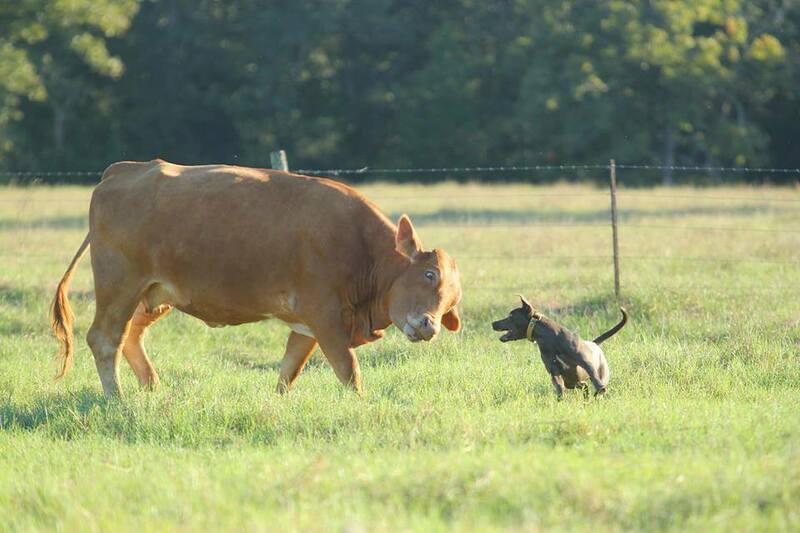 The problem is, it isn't easy to prevent those tiny, persistent and eerily aware critters from finding your dog. Ticks can sense trace gases, such as carbon dioxide, in the air, alerting them to the presence or approach of a warm-blooded mammal. Many ticks congregate in places where mammals tend to pass, such as in the bushes and trees along the edges of hiking trails, or even in tall grass or leaf piles in your own backyard. Ticks know where your dog is going. Creepy, right? But don't be afraid. A two-pronged approach to tick management can keep your dog (and you) safe and, if not always completely tick-free, at least protected from the dangerous diseases ticks spread. Just follow this plan: prevention and prompt removal. Precautions begin with keeping your dog well-groomed. Regular brushing, combing and bathing keep your dog's skin and coat strong and healthy. Ticks tend to prey on weak, dirty, sick animals with broken skin. A healthy, well-groomed dog is more attractive to us but less attractive to ticks, who prefer a dirty dog with a poor immune system for a host. To keep your dog's skin (and overall health) in even better shape, make sure s/he eats a balanced and high-quality diet, especially one containing esential fatty acids (EFA's) either in his/her food or as a supplement. EFA's help strengthen and improve skin and coat quality. I recommend using a tick control product on your dog, though some people feel the treatments (particularly the popular spot-on variety) are too strong and potentially dangerous to your dog's health. In a later post I'll talk about natural repellents and remedies. But for the moment, let's just say that if you take your dog into woodsy areas often, a monthly spot-on product is a great choice. Ask your veterinarian about the best and safest tick prevention products, because he or she will consider your dog's health, age, size, and also the risk of ticks where you live. Finally, keep your yard tick free. Keep woodpiles and brush piles far from the house and out of the fenced area where your dog plays. Keep your grass mowed short and trim the longer grass that grows along fences and around garden borders. If ticks don't have good, sheltered spots to hang out and await your dog's approach, they'll go somewhere more tick-friendly. Prompt removal is essential because the longer a tick is attached to your dog, the greater the chances that it will transmit a disease. 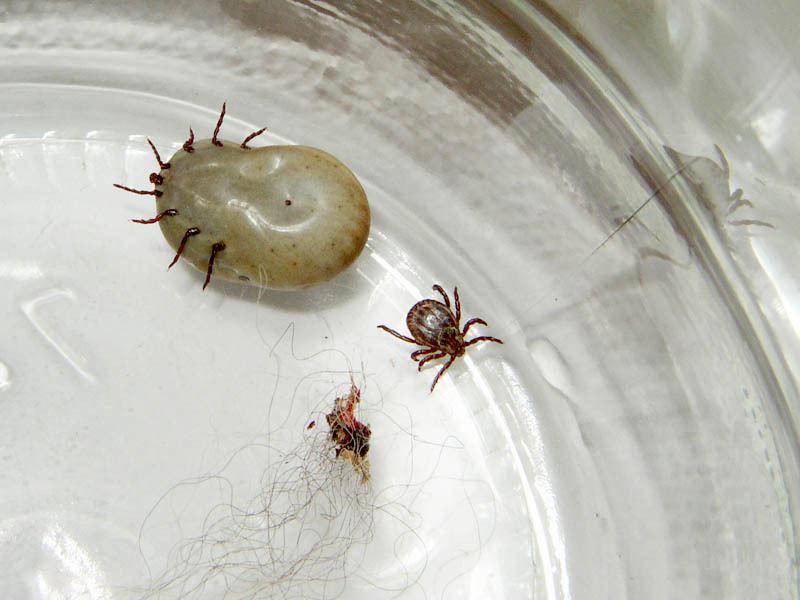 Most tick bites don't result in disease, but the chance that they could makes it important to remove the little blood suckers without delay. Every time you go into tall grass, shrubs, or wooded areas with your dog, do a tick check as soon as you get home. Work through your dog's coat with a fine-toothed steel fleas comb or, if your dog has a short coat, just use your hands to look and feel all over for suspicious bumps and creepy-crawlies. Look carefully in the areas ticks like to frequent, such as behind or inside ears, around the rear end under the tail, or on the chest and belly where there is less hair and the skin is easy to puncture. If your see a tick, use rubber gloves or a paper towel to protect your skin and remove it immediately. Drop in into a small cup of alcohol to kill it, then flush it down the toilet. If you think the tick has been attached for a day or more and you want to know if it might be carrying a disease, wrap it in a moist paper towel, put it in a small jar, and call your vet to see if s/he thinks you should have the tick tested. Grasp the tick as close as possible to where its head is attached to your dog. Pull straight up, not to the side. The tick may come all the way out, or it may leave its mouth parts behind. Don't worry if it does. Pull out whatever you can, then swab the area with disinfectant and dab on some antiobiotic cream. Your dog's body will eventually push out the foreign parts, but keep an eye on the area. If it starts to look infected - red, swollen, filled with pus - give your veterinarian a call. Every once in a while I see something about dogs online or on TV that makes me crazy. For example, I never watch America's Funniest Video's because the one time I did, they showed shots of dogs having weird accidents. It looked to me like the dogs were hurt, though not seriously. I was furious, then I saw that they do the same thing with children! There were scenes of toddlers falling down steps and, in one case, into a swimming pool. The audience thought it was hilarious. So a parent can earn thousands of dollars showing their kid having a funny accident. In several of the entries, the child was crying at the end. Guess I shouldn't be surprised that dogs were fair game. Then the other night I saw a major network feature on debarking dogs. At first I thought it couldn't be what it sounded like. But... lest we not have a clear picture, the producers showed dog after dog having their vocal cords cut or otherwise damaged, as with a laser. Per the usual network practice of "balancing the story", we heard from those who were in favor of this practice, as well as those who were against. Didn't help, as far as I was concerned. One of the dog owners was a Sheltie breeder who had had consistent complaints from neighbors because of barking. So she debarked her dogs! I watched 20 seconds of Shelties in her back yard opening their mouths to emit a sound that resembled a sick cough. Daphne was appalled. She slunk out of the room, looking over her shoulder at me in unmistakable rebuke. I felt ashamed for humans. 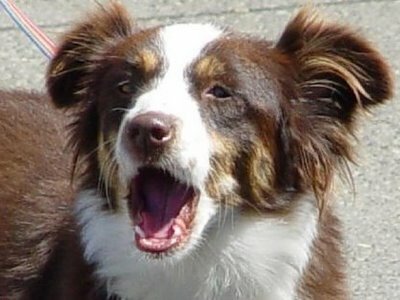 Debarking involves cutting the vocal cords, or otherwise impeding their vibration. The dog is anesthezied, then an incision is made under his/her chin. It only takes minutes. Whoopee for efficiency. And the neighbors don't complain... how nice. This practice is barbaric!! It reminds me of another century when prison guards cut peoples' Achilles tendons to prevent them from bolting. It's just one example of the lengths people will go to to avoid the work of training their faithful companions. People will use electric shocks; collars that spray stinging fluids like citronella in their eyes and mouth; prong collars with barbs that dig into the flesh of the dog's throat and damage his/her esophagus; and now surgery, rather than teach the dog how to live with humans. Sorry, but there's no excuse. It's sheer laziness, not to say the need for instant gratification. Would you use a citronella collar to stop your 3 month old daughter from crying??? Would you put barbs around the neck of a toddler who constantly pulls away from you and gets herself into trouble? I know, dogs are not children. But they are mammels with nerve endings and they hurt. It's just that they don't always show that they're in pain. So a Rottweiler with a prong collar who's dragging his master down the street doesn't look like he's hurt. If it hurt, he would stop, right? WRONG! Lots of dogs don't make the connection between pain and bad behavior. Almost all dogs can make a connection between good behavior and rewards. So why doesn't the guy teach his Rottweiler to walk nicely by giving him lots of hugs and treats when he does well?? It's just too hard, I guess. And then there's the issue of guys and macho dog breeds, but we'll leave that for another post. The argument was made that some people would have to put their dogs down if they didn't cut their vocal chords. One judge even ordered a dog owner to have it done or euthanize the dog. Thank heavens, that judge no longer issues such orders because someone showed him exactly what's involved, and it repelled him. He now orders people to train their animals or give them up for adoption. Anyway the argument is ridulous. If you can't or won't take the time and effort to teach your dog not to bark, then give your dog to someone who will. Get help!! (from a trained canine behaviorist). It'll cost maybe the price of a dinner for two and a movie.